Audiophiles and music lovers certainly appreciate the presence of turntables these days. In fact, these products offer a breath of fresh air amidst a society governed by modern gadgets and devices. Having a turntable that you can call your own is an advantage, and with options on the best turntable under 200, you can get one without breaking your bank. This guide will help you in getting yourself familiar with the top 5 turntable under 200, their features and capabilities, as well as comparisons with other strong contenders. This model is characterized by a combination of vintage and retro. It features a brass plate and dark wooden cage, giving this player that classic, old school beauty. It comes in a decent size, which still makes it rather portable to carry along with you to different places. Electrohome Wellington Record Player Retro Vinyl Turntable comes equipped with an illuminated tuning dial, as well as a traditional rotary control that nicely matches with the overall solid appearance of the cabinet. Regarding sound quality, this model produces the warm music that is distinct under this brand. It has two full-range dynamic speakers, which, when played within its wooden chest, produces a full and warm stereo sound. With this model, you have a broad function spectrum, vintage design, as well as overall good sound. In fact, this player is designed for this reason – to allow you enjoy either vinyl or radio music in the best way possible. While this player is not small that you can easily hide in a cabinet, and you may need to place it on a stand, its design will give any space an enhanced retro look. With its handcrafted wood chest, as well as the prominent lid, this model is a sure head turner. It also has a diamond tipped ceramic needle that offers an enhanced audio performance with a natural and warm tone which will not damage your most prized albums. I like the fact that despite being old-school in appearance, it can actually serve your purpose of listening to your favorite music, even the modern ones. In fact, you can also opt to plug the headphones right into the jack so that you can privately enjoy music. As a manufacturer in this industry, Audio-Technica is definitely not a new comer, thus providing a testament of quality. 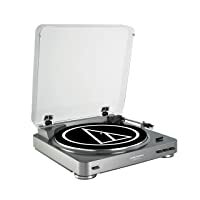 The AT-LP60 model is a fully featured turntable, which is also equipped with a pre-mounted phono cartridge, a metal platter, a built-in phono preamplifier as well as a clear plastic dust cover. With the built-in phono preamp, you can easily connect the line level outputs of this turntable to a fully integrated stereo amplifier, computer, AV receiver, or other devices that come with an analog input for audio. This offers convenience at its best. As a belt-drive turntable, the AT-LP60 has a motor pulley which spins the platter using a rubber ‘belt’. It is compact in size, which also makes it convenient to use. The output of this turntable is limited to a hardwired cable that is terminated to a complete set of stereo RCA plugs. For an additional convenience on your part, the company has upgraded the counterweight of the tonearm, setting the stylus tracking force at the same time. This makes everything easy to access within this turntable. A downside to this model, however, has something to do with its design. This is because you do not have the option to upgrade to a better quality phono cartridge. However, to offset this issue, the stylus of the cartridge is replaceable. Compared to other cheaper options under this category, AT-LP60 offers better features which produce high sound quality overall, from bass to treble, giving that smooth balance all throughout. What I like about this turntable is that it eliminates the hassle of other models in operating the turntable. All you need to do is to put the LP on the platter, press the button to start, and the platter automatically starts turning while it lifts its tonearm, completing the operation. Crosley CR6232A-BR Nomad offers several features, including USB connectivity. Therefore, you can easily put all vinyl LPs on your digital files, plug in the USB, and observe as this turntable produce digital files while the record is playing. The best part is that the software needed is included in the package. This is a belt-driven model, which means you can expect less vibration. The belt works like an effective shock absorber, protecting the platter from resonance which may come from the motor. As a portable turntable, the Crosley CR6232A-BR Nomad can play 33 1/3, 45 and 78 RPMs. It also comes equipped with a two 3-inch stereo speakers, all built-in. As such, it is very important to select a unit that comes with a good position for the speaker especially if you are aiming to hear the best sound quality that it can produce. With this model, a headphone jack and RCA jacks are also included, which means that you can easily connect it to your personal external speakers. It also has a built-in preamp, which makes it an amazing plug and plays equipment, even minus the external speakers. For a low-priced turntable, this model is obviously aesthetically pleasing. Its wooden style cabinet provides it with that retro look. The manufacturer clearly did not compromise the materials used in making the parts either. 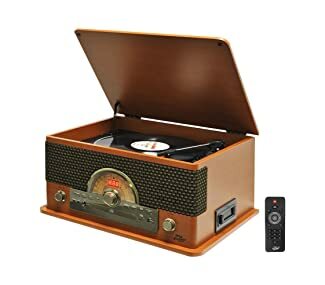 What I like about the Crosley CR6232A-BR Nomad is the fact that despite being affordable, the manufacturer did not cut down on the capabilities and features of the unit. It is solid, and made by a well-respected brand in the industry. The Pioneer PL-990 Automatic Stereo Turntable is an entry level player. It comes with fully automated functions, along with a built-in phono equalizer which may be attached to an auxiliary input or a line. It also comes with a moving magnet cartridge which has a diamond stylus. This model is also endowed with a classic design, similar to those of the 60s and the 70s. It comes in all-black with simple buttons located on the front panel. It gives that overall retro look which can easily complement your house décor. Pioneer PL-990 Automatic Stereo Turntable concentrates further on sound quality, rather than appearance. As a belt-driven turntable, it may not be ideal for DJing, as well as scratching. The feet of this turntable is also small, yet wide, with an anti-vibrating substance which can prevent issues related to skipping, shaking as well as knocking over. I believe that this model can really compete with other options in this category simply because it comes with automatic functions as well as variable speed on the device. In fact, all you need to do is to turn the motor ‘on’, and it will automatically start rotating, while the tone-arm starts to lower down. This vintage styled turntable is an interesting combination of classic record playing of music, alongside the latest technology of today. It comes with a built-in Bluetooth as well as a full range stereo speaker which allows you to stream music wirelessly from other modern devices. The entire system is housed in a beautifully styled cabinet which easily attracts attention, being the centerpiece of any room in your house. Aside from its looks, this model is field with several other features that make it a good option. For example, its recording function (vinyl to MP3) provides the possibility of saving all old records, turning them into digital MP3 files. This allows you to share your favorite music with other people, including family and friends. What I really like about this turntable is that it works compatibly with various Bluetooth devices, while allowing you to stream coming from a Bluetooth compatible device, going to the unit directly. If you are purchasing a turntable at a price of $200, it would be best to take some factors into consideration. These factors include the following. There are not many options within this range. Therefore, you may have to deal with intense decision making before purchasing. A turntable for a price of $200 is one that is ideal for beginner audiophiles. 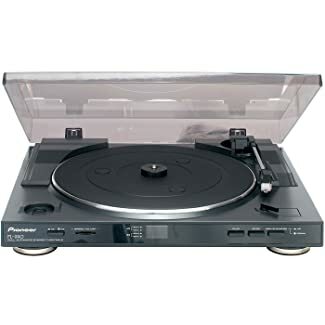 The turntables that are under this category range are often configured to enable several performance upgrades for solo components, such as belt, cartridge, stylus and others. 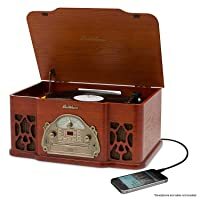 Many options of turntables under this list are those that are vintage looking while being equipped with built-in speakers with several other additional features such as AM/FM radio as well as a CD player. As such, you can choose the features that you would like to see in a model, and start from there. It is good to have at least a basic understanding of how a turntable works. Regardless of whether the price is at $200, or ones that are more expensive, knowing the basics of this system will allow you to make that good choice. Decide whether you would like to consider upgrading later on. There are some models under this range which offer upgradeability, while others will simply allow you to stick to the model as it is. Others feel that they do not have the right to look for quality, provided that the 200 range is considered low. However, with competition being tough in the market, it is still possible to find amazing options in this category. After all, it is not all about price. While the products listed below may be considered as cheap, price-wise, the features and quality of the models are not sacrificed and compromised at all. Therefore, you still have the liberty to choose accordingly based on the features presented, as well as your personal preferences and taste. The list above features different models on turntables. Each of them come with their own set of features, highlighting their advantages and disadvantages. 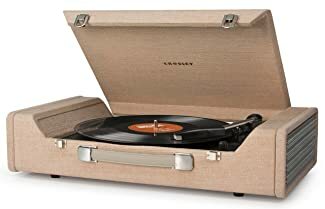 Therefore, the final say is up to you, depending on the features that you would like to see for your very own turntable. However, if you are searching for a good combination of design, performance and overall quality, the Electrohome Wellington Record Player Retro Vinyl Turntable is a recommended choice. While its design may be the so-called ‘old-school’, its features make it possible to play even digital files on USB.